Several years ago, I wrote this popular post on “Diner Speak” and I decided to repost it with a few additions as you, my readers have added a few descriptions that you remembered from your past. So thank you for that. Yes, these were the days of poodle skirts, Cherry Phosphates, and Leave It To Beaver! Yellow Blanket on a Dead Cow and Make It Cry! Let me explain, before you think I have gone over the edge….:)! Every now and again, the Captain and I go to a small Diner here in the Cape and if we are sitting close enough to the kitchen, we can hear the communication between the wait staff and the cooks as food orders are “put in”. It reminds me of a day gone by as these days, customer orders are almost all electronic…which sometimes isn’t necessarily a more efficient way…. and it certainly is less colorful as the Older Diner’s way of communicating. No, I don’t mean the Diner person is old…I mean the Mom and Pop Diner is most likely non-existent these days. They have been replaced with widgets, gadgets, and all kinds of modern equipment to make your dining experience one you won’t forget. More on that… further down this post. ???? If you would like to see my review of this Diner…click Lost in the 50’s Tonight! My Mother and Father bought a small cafe in an even smaller town shortly after I was married. I wasn’t there every day, but I came to know through my Mother, … “Diner Speak” …from her days as a waitress at the famous Mulbach Hotel and Cafe in Kansas City. Mother was quite the adventurous young lady as she set off for the big city 400 miles away… right out of high school. She wanted to see how the sights and sounds differed from the place where she was born… (Niles, Kansas), population at that time about 25 in the town and perhaps 25 farmers living all around the town. (But that is another post.) I loved hearing Mom spout off “Diner Speak” and explaining to me the actual meaning. At first I thought the “Diner speak” was a shorter version of the actual food names ordered through the small window to the cook, but as she explained…it certainly was not faster to call out the order of “Adam and Eve on a raft and wreck ’em” to calling out “two eggs scrambled on toast”!. However, it was a way for the “family” of wait staff and cooks to define themselves,…to be different in a community of niches. Mom always justified the “Diner Speak” with terms like… “Well, Longshoreman speak a language of their own.” emphasis on the word their. I was always puzzled by the comparison because we were as landlocked as one could be…. situated in the middle of the United States with the closest water being the narrow Smokey Hill River! Perhaps these niches of a special language used to keep insiders in and outsiders out, have failed to survive in this day of political correctness. I don’t know; but what I do know is I enjoy hearing the “Diner Speak” and below I have listed a few of the many food descriptions that my Mom taught me, as well as a few more. Below are a few of my favorites, and I am sure you know some of these and can add a few of your own. 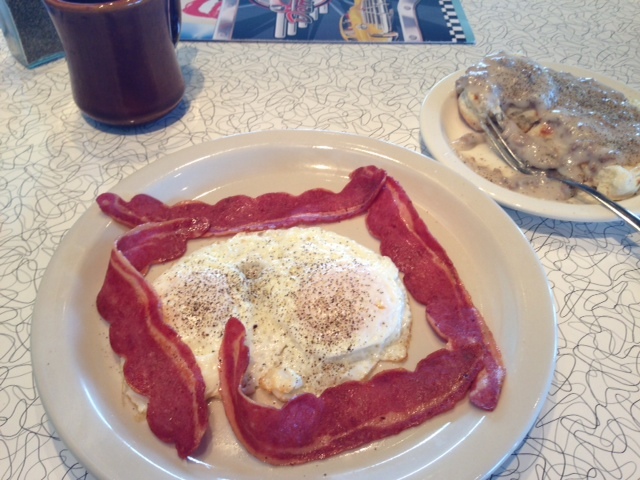 And yes, that was my meal one morning at our little Diner! Hey, I did some cardio afterwards! Well, if I didn’t, I meant to. Burn one, drag it through the garden and put a rose on it: Hamburger with lettuce, tomato and onion. Fry two and let the sun shine: Two eggs sunny side up or eggs which have not been flipped over. Add Hail to the MD: put ice in the Dr. Pepper. First Lady with Idaho Cakes in the alley: Ribs with Hash brown Patties on the side. Ice and throw it in the mud: Ice cream with chocolate syrup. And as far as the electronic age being better or faster in the food ordering world…the Captain and I were eating at Richee B’s one evening and we waited and waited for our food. Finally, we asked the server (guess you can’t call them waitresses anymore) if there was a problem and she replied. “So is it connected now?” I ask with tummy rumbling. As a sidenote….since this was first posted, both the Starlight Diner and Richee B’s have gone out of business. Times have changed…and so have we. « There Is No Place Like Home! Hi…what a list! Loved it! brings back memories huh? thanks for stopping by Karole. LOL Things haven’t gotten better, Kari. We may be going down hill very fast. so true Sandy…..it is amazing just how many changes have happened in our lifetime….thanks for stopping by.